The following Art Kits were added to the CSC Collection fall 2018. Special thanks to Debbie Harris, former KPBSD Art Specialist, for designing and creating these kits. Visit the CSC Online Catalog to reserve any of these kits! KPBSD has two new options for digital content this year. 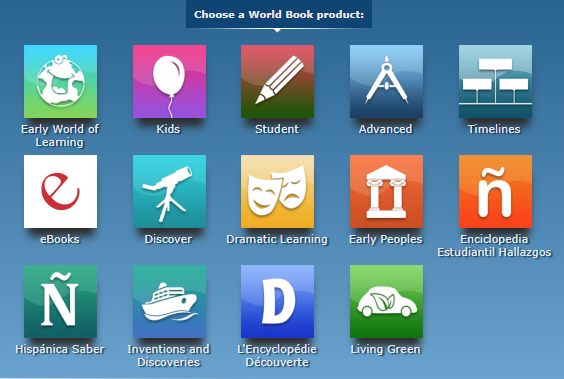 World Book Online has added eBooks to our suite of database choices. Click on the eBook icon at World Book Online to browse the collection. These eBooks are available to all KPBSD students/staff. TumbleBooks – This special subscription is available through June 2020. Includes ebooks, animated ebooks, and videos for kids in kindergarten through middle school, in English, Spanish, and French. Flash is required to access animated and video content. Available as an iOS or Android app. Paid for by the Alaska Dept. of Education and Early Development. This is an amazing resource! Check it out. To create personalized class and student Tumbletracker accounts, contact Tumblebooks support at rino@tumblebook.com. Both World Book eBooks and TumbleBooks require internet connections to access. Neither have downloadable titles. Contact Karla Barkman for more information ~ kbarkman@kpbsd.k12.ak.us / Extention 2379. If you are reserving items from the CSC Alexandria online catalog, please watch the video linked on the right-hand side of this page. It explains how to log in to your account and how to make a reservation once you have found an item you want to reserve. The hardest part is getting the correct date range. When the reservation calendar is open, click the date you want your reservation to begin. Click on each Friday until you reach your desired end date. The word “New” should appear on the start date, end date, and all dates in between if your reservation has been made correctly. Fridays are the only options for start/end dates due to the fact that the CSC is housed at Soldotna Prep School. Friday is the day the district truck comes to SoPrep, thus anything leaving or returning to the CSC will happen on a Friday. Please plan accordingly when reserving items. Thank You! The Curriculum Support Center (CSC) which was formerly known as the District Media Center (DMC) has moved to Room 7 at Soldotna Prep School. Karla Barkman is taking over the management of the CSC collection at its new home. Cindy Nagle, who has managed the collection for years, will be in a new position for the 2016-2017 school year. Thank you Cindy, for all you have done for KPBSD staff working at the CSC. The reservation/delivery process will change slightly for CSC materials. Reservations can still be made from the online catalog but they will only be shipped on Fridays as that is the warehouse pickup day for Soldotna schools. Reserved items will be delivered to each site on the delivery day for that school. Due to the move of materials, the reservation system will not be up and running until September. Please check back for updates. Feel free to contact me, Karla Barkman, with questions.